The Making of 'Downfall' Downfall, directed by Oliver Hirschbiegel, is among the Oscar nominees for best foreign film. The German-made effort details the last days of Adolf Hitler, played by Bruno Ganz. Hirschbiegel and Ganz talk about the film in a wide-ranging interview. Downfall, directed by Oliver Hirschbiegel, is among this year's Oscar nominees for Best Foreign Film. 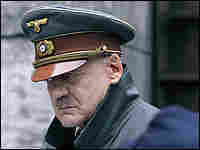 It details the last days of Adolf Hitler, as played by the actor Bruno Ganz. Ganz and Hirschbiegel offer their thoughts on the film in a wide-ranging interview with Scott Simon.